Shadow Chancellor George Osborne writes an op-ed in the Times today in which he sets out overall Tory spending plans for the next three years. Below is a fisk of his article setting out the strengths and weaknesses in his arguments. This summer we have seen again just how interconnected our world economy has become, as mortgage defaults in America have sent shock waves through financial markets in London. It is a reminder of just how important economic stability is." TPA Research comment: It’s more a reminder that Britain is a small open economy that is sensitive to global capital flows. TPA Campaign comment: In uncertain times, voters are more inclined to stick with what they’ve got, rather than risk bringing in untested people on the back of election promises. Gordon Brown already has significant leads over David Cameron on strength and trust in time of crisis. The difference on “economic competence” is negligible, and certainly within the margins of error. Nothing suggests this will change. If the ship of state is going to hit stormy waters, you do best to keep with the Captain you’ve got. If the ship actually capsizes then all bets are off anyway. "That is why the Conservative priority is to put stability first and keep interest rates low. But stability by itself is not enough – after all, graveyards are pretty stable places." TPA Campaign comment: Stability does resonate with people. But the same reason people like fixed-rate mortgages is the same reason they prefer fixed-governments when times feel less stable and prosperous. "In this age of intense international competition we also need to be competitive. That means simpler taxes and lower tax rates. It means an education system that gives more of our fellow citizens the skills they need to share in the world’s prosperity." TPA Research comment: He’s right here. TPA Campaign comment: Competition is going to become a big issue, as more and more people are affected by outsourcing (a potentially massive crisis for Western economies that has only just emerged as a mainstream political issue in the States). "Gordon Brown believes that you can either have good public services or lower taxes, but you cannot have both. As a result, his Government has achieved neither." TPA Research comment: Not sure how the second sentence logically follows on from the first, but it’s true of course. "We have the highest tax burden in our peacetime history and yet our cancer survival rates are the lowest in Western Europe and four out of ten 11-year-olds cannot read, write and add up properly." TPA Research comment: Right again. But the point is that this is an inevitable result of education and health care systems that are centrally run by politicians who lack management experience and subject knowledge, and are in their posts for too short a period. Not to mention the lack of true patient/parent power. A handicap that only some form of voucher system can correct for and something the Conservatives are not advocating. "This record of failure shames us all and demands a different approach. Government should share the proceeds of economic growth between the funding our public services need and the competitive lower taxes our economy demands." TPA Research comment: Sharing the proceeds of growth is not a different approach. Brown followed it in his first few years as Chancellor by adopting Clarke’s spending plans. TPA Campaign comment: Politicians are all the same. "When David Cameron and I first said this two years ago, Mr Brown trotted out the tired old attack that we would cut services. The irony is that he has now been forced to adopt our approach to spending. 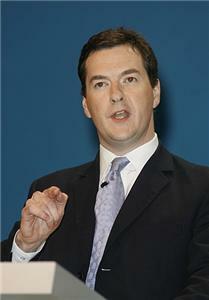 For in this year’s Budget he committed the Government to sharing the proceeds of growth over the next three years." TPA Research comment: Again this is completely untrue. It’s been clear for years that spending growth would slow to below the trend rate of economic growth from 2008 onwards. For example, the 2004 Budget projected Total Managed Expenditure to increase by 4.5 per cent in nominal terms (around 2 per cent after inflation) between 2007-08 and 2008-09. The 2005 Budget (before Osborne became Shadow Chancellor) projected Total Managed Expenditure to increase in nominal terms by 4.5 per cent between 2007-08 and 2008-09 and by 4.8 per cent between 2008-09 and 2009-10. The 2007 Budget projects Total Managed Expenditure to increase in nominal terms by 4.9 per cent between 2007-08 and 2008-09, by 4.7 per cent between 2008-09 and 2009-10 and by 4.5 per cent between 2009-10 and 2010-11. In other words, there has been virtually no change to Brown’s post-2008 spending projections since 2004 – it has been consistently clear that spending growth in real terms would be below the trend rate of economic growth from 2008 onwards. TPA Campaign comment: There is no evidence that “We told you so…” is (or has ever been) an appealing campaign message. "The spending totals for the years 2008-09 to 2010-11 show public spending growing by 2 per cent in real terms, significantly below the 2.75 per cent trend growth rate of the economy." TPA Research comment: It is true that GDP growth is forecast by the Treasury to be between 2.5 and 3 per cent in 2008 and 2009, but Table C3 in Budget 2007 (“Economic assumptions for the public finance projections”) shows that GDP is forecast to increase by 2.5 per cent annually between 2008-09 and 2011-12 for the purposes of forecasting the future state of the public finances. Given that room for reducing taxes will come from improved public finances, it would make more sense to compare Osborne’s spending plans with these public finance assumptions. Looked at this way, 2 per cent annual growth in spending is not “significantly below” economic growth. TPA Campaign comment: Try explaining the “significant” difference between 2.75 per cent and 2 per cent on the doorstep of a marginal voter in the West Midlands. "As Mr Cameron quickly pointed out to Mr Brown when he replied to the Budget: 'He has spent all year attacking our policy and making ludicrous figures for cuts in public spending, but now he is introducing it.'" TPA Research comment: See above – Brown is not implementing Cameron’s policy because the decision to slow the growth in public spending to below economic growth was taken a long time before Cameron became Tory leader. "Today I can confirm for the first time that a Conservative Government will adopt these spending totals. Total government spending will rise by 2 per cent a year in real terms, from £615 billion next year to £674 billion in the year 2010-11. Like Labour, we will review the final year’s total in a spending review in 2009." TPA Research comment: The above spending numbers are exactly the same as in Budget 2007, and so are liable to minor revision, as Brown’s spending totals have been, nearer the time. That said, Osborne has always said that he’s not going to write his first budget before the election. Budgets have an expenditure side and a revenue side. By writing the expenditure side today, Osborne has written half of his first budget. "The result of adopting these spending totals is that under a Conservative Government there will be real increases in spending on public services, year after year. The charge from our opponents that we will cut services becomes transparently false." TPA Campaign comment: "Transparently false" yes, but not necessarily any less convincing (and certainly not any less arguable – see below). Since when in politics has the objective truth of a given policy always trumped attempts to misrepresent that policy by your opponents? What about failed campaigns? The risk for the Conservatives now becomes that the Labour allegations continue (as they surely will – though resonating less than they did in 2001), the Tories get increasingly frustrated, and get into the habit of noisily “rebutting” the charge by singing from the rooftops about how much they are going to be spending (and how much they enjoy it). This will probably not convince swing voters (see below), but definitely will rile the Tory grassroots no end and is exactly the kind of thing that will keep their core vote at home on polling day. "At the same time the share of national income taken by the State will start to fall, as the economy grows faster than the government does. Pursuing this approach over an economic cycle creates the headroom for sustainably lower taxes." "We have come to our position by conviction, believing all along in a policy of sharing the proceeds of growth. Mr Brown has been driven here by necessity, thanks to his own fiscal imprudence. For the rapid increases in public spending over the last decade have – as we consistently cautioned – turned out to be unsustainable." TPA Campaign comment: Convictions are based on moral absolutes, not triangulation and technocratic platitudes. Voters will not be inspired by politicians whose convictions amount to “I am a convinced sharing-the-proceeds of growth-er”. Growth rules are a fiscal practice and response to a specific political and economic context, not an unchanging principle of government. John Howard in Australia has convictions (he believes in lower taxes - and says so), and he has delivered lower taxes (and more public spending incidentally) by following a growth rule. But he chose this policy route in government based on his convictions. Growing public spending at a slower rate than the economy is just what a good Conservative government does in office – it isn’t what an opposition party commits to in order to win an election. And it isn't a conviction. "Even with successive stealth tax rises, Gordon Brown has still managed to bequeath to his successor the largest budget deficit of any leading European country this year. It is quite something as a Chancellor to make Italy look like a beacon of fiscal prudence." TPA Campaign comment: Fiscal conservatives have always had a bizarre aversion to government debt, despite the fact that debt as a concept has been normalised in the last decade. People naturally understand that governments (like families) have to borrow. Why borrowing to fund spending (as a Conservative Chancellor would do) is ok, but borrowing to invest in supply-side tax reforms that pay for themselves later is not, is completely beyond us. Reducing government debt only becomes a campaign plus point if you can do a John Howard and eliminate the budget deficit entirely (as Australia achieved in 2006 but not possible in Britain under any scenario this side of 2020). It makes no material difference to the average voter whether total government borrowing goes up or down. It matters a lot of difference if a government chooses to raise taxes to reduce the deficit (especially when they promised not to raise taxes at the preceding election, ala Ken Clarke in 1995). TPA Research comment: What’s really important here is not so much the fact that Brown is running a large deficit at the point in the economic cycle where he should be running a surplus, but all the debt hidden off-balance-sheet. The single largest debt problem Britain faces is not net debt, which is relatively low at less than 40 per cent of GDP, but unfunded public sector pension liabilities, potentially at close to 100 per cent of GDP. Two years ago, the Government backed away from a plan to raise the public sector retirement age for existing workers to the state pension age in the face of union strike threats. If Osborne is serious about economic stability in the future, he should pledge to reform the generous public sector pension arrangements when in office. Now that would be a fiscally responsible thing to do. "Faced with this budget deficit, Gordon Brown took two characteristic courses of action. First, he spent the 2005 general election accusing his opponents of lying about the “black hole” in the public finances and then, without blushing, increased taxes after the election on business, oil production and air passengers by £6 billion." TPA Campaign comment: In other words, we oppose Brown because he is a hypocrite (and beat us in an argument during the last election campaign); not because of what he actually did (would the Conservatives had rather he didn’t increase taxes and went on spending so the deficit got larger? Yet more muddled criticisms). TPA Research comment: Yes, he did. Taxpayers would therefore benefit if those rises were reversed. "Secondly, he delayed the inevitable slowdown in public expenditure growth by delaying the spending review by a year, until his succession to the premiership was assured." TPA Research comment: Delaying the spending review is irrelevant since it covers the same years 2008-09 to 2010-11. And, as mentioned above, previous budgets showed than overall spending growth would slow from 2008 onwards. "Adopting these 2 per cent a year spending plans has implications for the manifesto that we will offer the country at the next election. It means we will not be offering unfunded spending commitments. Additional spending in one area will be matched by a spending reduction in another." TPA Campaign comment: Does it work the other way round? If wasteful spending that can’t be justified on any basis is uncovered and has to be rooted out, do the Conservatives pledge only to do so if they can find a way of increasing spending by the same amount somewhere else? TPA Research comment: If tax revenues come in less than forecast, then, by giving overall spending numbers, unfunded spending commitments is precisely what Osborne has done! It’s pretty meaningless to say that additional spending in one area will be matched by spending reductions elsewhere – overall spending will simply be equal to the numbers Osborne has set out. "There will also be no election promises of up-front, unfunded tax cuts. Any reduction we offer in one tax will have to be matched by a tax rise elsewhere. I made this clear more than a year ago, and said that we would focus on the crucial job of simplifying our taxes and on shifting the burden away from taxes on income and savings and towards taxes on pollution." TPA Research comment: If spending grows by 2 per cent and the economy (for the purposes of the public finance projections) grows at 2.5 per cent, then 0.5 per cent of public spending (around £2.75 billion) would be available for cuts in the overall tax burden. Over three years, that’s around £10 billion for tax reductions. Or it’s £10 billion to reduce the deficit, almost enough to halve it from the current baseline. So, clearly, it would be entirely possible to offer tax reductions at the next election without increasing borrowing relative to the current baseline. It’s nonsense to say that these tax reductions would be “unfunded”. By committing not to commit to reduced taxes at the next election, Osborne is committing to share the proceeds of growth between higher public spending and lower borrowing, not between higher public spending and lower taxes. "The public are rightly cynical of promises to cut taxes produced like rabbits out of a hat at election time. Gordon Brown’s preelection budgets have made them wise to that trick." TPA Campaign comment: Unfortunately, the TaxPayers’ Alliance's new YouGov poll suggests that voters are also rightly cynical of politicians’ motives on green taxes as well, with 63 per cent agreeing that “politicians are not sincere about the environment and are using the issue as an excuse to raise more revenue from green taxes”. This is true now, so applies whether tax cuts (or green tax increases to pay for other tax cuts) are laid out in advance or rushed out shortly before an election. Michael Howard (and others) said that low-taxes were not a “Silver Bullet” for the Conservative Party. As we have said before, this is obviously right. However, there aren’t any “Silver Bullets” in politics at all. That does not mean that lower taxes cannot be sold. Over the long-term (no hats and no rabbits) you just have to decide whether you want to make the case or not. Ultimately, this will depend on whether the Conservative Party still genuinely believes that lower taxes are a prerequisite for a healthy economy and society, and consequently, whether it is worth spending serious amounts of time and money on making the case. "What people want to know is whether you have a long-term sustainable plan to reduce the tax burden on families and on businesses – so that taxes cut one year are not then followed by tax increases a year later." TPA Research comment: Given his spending plans, Brown could cut taxes overall by around £2.75 billion a year from next year onwards. Brown could therefore also manage sustainable tax reductions. "That is exactly what the Conservatives now have in place. First, it will be done by sharing the proceeds of growth over a cycle so that the economy grows faster than the government. A 2 per cent growth in spending is consistent with that approach; indeed, it is less than the growth in the first Thatcher Government." TPA Research comment: Perhaps a second and third term Tory government, as in the 1980s, will seriously bring taxes and spending down as a share of GDP but, as yet, taxpayers have little reason to be convinced. "Secondly, it will be achieved by doing the serious policy work that ensures we get much more for the money we do spend – so that the ever-growing demands on government do not lead to an ever-growing tax bill." TPA Research comment: “Ever-growing demands on government” sounds like an excuse to increase spending. What are these ever-growing demands exactly? "That is what our policy review is doing, as the innovative ideas in this week’s report on education show. At the centre of this approach is moving away from Labour’s top-down, statist methods that have seen hospital wards closing even as NHS spending doubles, and instead trusting people and communities to decide how their tax money is spent. The objective is a government that is less intrusive, promotes social responsibility and so gives its citizens greater control of their lives. The result is a stronger society and a competitive, low-tax economy. That will never come from this particular Labour Prime Minister." TPA Campaign comment: More mixed messages. Ultimately, this remains the fundamental handicap of the Opposition's fiscal policy. The fact that senior Conservatives – despite numerous attempts and lots of media goodwill in the early days – still cannot explain in a single sentence what their tax policy amounts to in language ordinary voters understand is a serious problem. Even a 1,000-word article in The Times is not good enough (just think of the chances for a 300-word Sun article). Of course, fiscal policy is complicated, but you can make these things more difficult for yourself at the same time as making your argument less attractive. Voters will most likely do two things in response to the current policy: 1. Conclude “You’re all the same” and vote on other issues as they were perhaps going to anyway, or as is more likely, abstain entirely as increasing numbers already do, convinced that if they really want lower taxes there is no-one they physically can vote for. 2. Conclude, “The Tories are trying to con us … and/or I don’t understand what sharing the proceeds of growth means, I smell a rat”. Large numbers of these swing voters will then revert to their former default instincts ("Tories want tax cuts more than they want higher spending") and vote Labour or someone else accordingly, in broadly similar proportions as they did in 2005. Unfortunately, despite the arrival of Brown in No.10, the essential Conservative Party motive has not changed. Tories are desperate, absolutely desperate, to take tax and spend out of play at the next election, and this is their attempt to do just that. They think that they can win an election without talking about spending almost as much as they believe they cannot win an election by talking about immigration. This is not just wrong in itself, it is also music to the ears of Gordon Brown. All he has to do between now and the election (the date of which will be chosen by him, not George Osborne), is to cut a tax or two and the election is in the bag. The sort of small, affordable and tokenistic tax cut – like doubling the inheritance tax threshold (would need about £2.75bn...) – that could be pulled out of the hat a month before the election. Just enough to delight the Daily Mail readers in the Labour marginals in the South and send the Tories into a complete panic. Would such a move then be condemned by George Osborne as causing damaging economic instability, or would they pledge to “match Gordon Brown’s tax-cutting proposals”? The latter would just be formal recognition that the economic policy of Her Majesty’s Opposition has been out-sourced to the office of Ed Balls MP. "The fight for the lasting change that achieves this vision has only just begun." TPA Campaign Comment: By committing the Conservative Party to Labour’s spending plans, the fight is over before it has even begun.